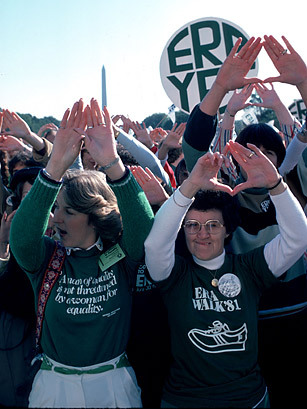 One of the major causes of second-wave feminist movement, the Equal Rights Amendment (ERA) inspired demonstration after demonstration in the '70s. It sounds simple enough now, but at the time the ERA  which guaranteed women the same rights as men  was a major milestone. Passed by Congress in 1972, the ERA had 10 years to be ratified by 38 states. However, a few states, like Illinois, stubbornly resisted and quickly incurred the attention of the National Organization for Women (NOW). The first demonstration was in May 1976, when NOW organized some 16,000 protesters in Springfield. But when Illinois held out, NOW persisted. The group organized more marches throughout the decade and on Mother's Day in 1980, a record 90,000 people demonstrated in Chicago in support of the ERA. While Illinois continued to resist ratification, the ERA marches became one of the defining efforts of the women's movement.